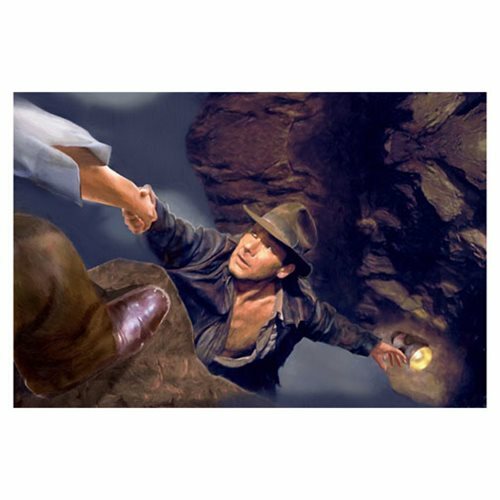 Even Indy needs a helping hand sometimes! Artwork inspired by Indiana Jones and the Last Crusade. Limited edition of only 95 hand-numbered pieces, signed by artist Masey! Canvas print measures 24-inches wide x 16-inches tall. Interpretive artwork inspired by Indiana Jones and the Last Crusade, this captivating Indiana Jones and the Last Crusade Hand from Above by Masey Canvas Giclee Art Print is a limited edition of only 95 hand-numbered pieces, signed by artist Masey. The marvelous unframed giclee on canvas measures 24-inches wide x 16-inches tall and comes with a certificate of authenticity.